In this free video drum lesson I show you how to play the great Intro drum fill from the song “Where Eagles Dare” by Iron Maiden, drummed by Nicko McBrain. Nicko busts out some serious chops for this drum lick, with flams and classic rock ideas all being thrown into the mix. The song is in the 12/8 time signature so the drum fill has a triplet based feel to it. The drum fill is two bars long and and involves a six beat lick that’s played three times. The first half of bar 1 shows this six beat pattern and you can see that the second half of bar 1 and the first half of bar 2 are played exactly the same. Only the second half of bar 2 is different. The six beat pattern itself start with a flam and then moves into a lick that I call the “Fa-De-La-Dump“. This four note triplet lick starts on the snare then moves to the high tom, floor tom and then bass drum (played right, left, right, foot). All four notes are played evenly with the bass drum falling exactly on beat 3. 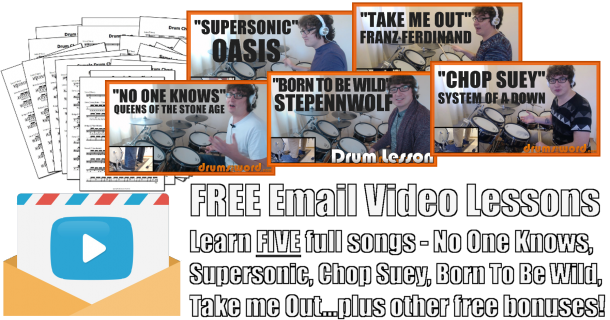 You can view another two free drum lessons teaching the Fa-Da-La-Dump lick by clicking here or here. Counted beats 4, 5 and 6 of bar 1 are played on the high tom, starting with the left hand. The first six beats of bar 1 are then repeated another two times as previously mentioned. For the second half of bar 2, Nicko stays up on the high tom and plays a Bonham style triplet lick, right hand, left hand and then the bass drum. The flam on the snare drum is played on beat 4 directly after the bass drum. You can view another two free drum lesson on the Bonham triplet lick by clicking either here or here.